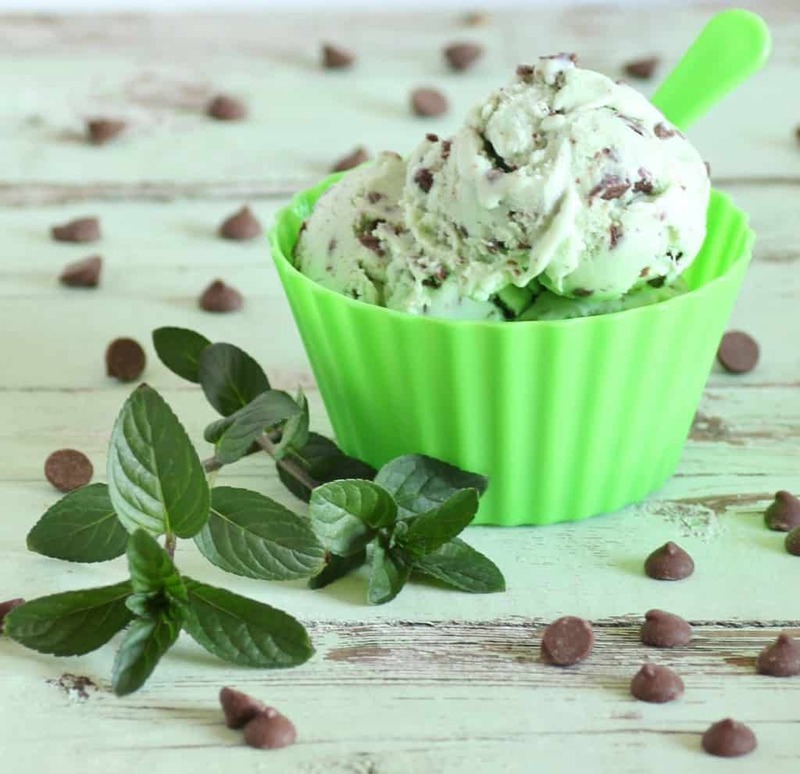 This is one of Amber’s favorite ice creams, Mint Chocolate Chip Ice Cream. I make this for her every summer when I can get my hands on some fresh mint. This year we are growing Chocolate Mint out back so we have lots to make her summertime treat. I have a book from Williams and Sonoma that I use to adapt my ice cream recipes from. They always turn out rich and creamy and full of flavor. This ice cream has a real burst of fresh mint taste, so good!! Combine the milk and 1 cup of cream together with the mint leaves in a small saucepan. Cook for about 5 min. over medium heat until it just starts to simmer. Remove from heat and let it steep for 20 min. Strain to remove the mint leaves. Meanwhile, whip the egg yolks, sugar, salt and the 1/2 cup heavy cream together until smooth. Slowly add a 1/2 cup of the warm milk and then add all the egg mixture to the milk mixture. Return to the heat and cook over medium heat stirring constantly with a wooden spoon. Simmer the custard but do not let is boil. Continue cooking until the custard coats the back of a wooden spoon and leaves a clear trail when your finger is drawn on the back of the spoon, 4-6 min. Add the food coloring if using. Now cool the custard by placing the saucepan into a larger bowl filled with ice and water. Stir until cooled. Cover with plastic wrap that is right on top of the custard so it won’t form a skin. Cool completely in the refrigerator for 3 hours or overnight. Pour the custard into the ice cream maker and follow manufacturers instructions. When nearly frozen, like thick whipped cream add the chopped chocolate while the machine is churning. Transfer to a freezer safe container and freeze for 3 hours or a few days until serving. So good!! Adapted from Williams-Sonoma Ice Cream book. Ya, you have to use the good stuff. I have made this many times, my daughter loves it. It has a real fresh mint taste, so good!! YUM!!!! I love chocolate and mint!!!! You are so welcome, thanks for hosting!! This looks and sounds amazing! I love making ice cream and have yet to make mint chocolate chip! Thanks Katie, I make this every year and it is so good!! This recipe looks amazing, it convinced me to buy an ice cream maker! Thanks so much Lauren, it is the one I make most often! !